Not to be confused with D battery. Delta cells (δ-cells or D cells) are somatostatin-producing cells. They can be found in the stomach, intestine and the pancreatic islets. In rodents, delta-cells are located in the periphery of the islets; in humans the islet architecture is generally less organized and delta-cells are frequently observed inside the islets as well. In both species, the peptide hormone Urocortin3 (Ucn3) is a major local signal that is released from beta cells (and alpha cells in primates) to induce the local secretion of somatostatin. Ghrelin can also strongly stimulate somatostatin secretion, thus indirectly inhibiting insulin release. Viewed under an electron microscope, delta-cells can be identified as cells with smaller and slightly more compact granules than beta cells. 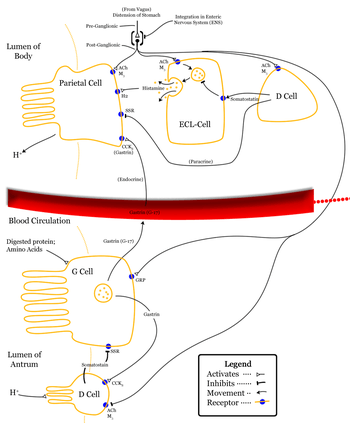 D cells in the stomach contain CCKBR (which respond to gastrin) and M3 receptors (which respond to Ach). Respectively, these receptors will increase somatostatin output and decrease somatostatin output from the D cells. VIP, vasoactive intestinal peptide, acts positively on D cells resulting in more somatostatin being released. In the stomach, somatostatin acts directly on the acid-producing parietal cells via a G-protein coupled receptor (which inhibits adenylate cyclase, thus effectively antagonising the stimulatory effect of histamine) to reduce acid secretion. Somatostatin can also indirectly decrease stomach acid production by preventing the release of other hormones, including gastrin, secretin and histamine which effectively slows down the digestive process. A tumor of the delta cells is called a "somatostatinoma". When a person is infected with H. pylori the lower region of the stomach, the antrum, is predominantly inflamed. This is where most of the D cells in the stomach are. The bacteria produce a cloud of ammonia around themselves using urease to protect them from the stomach acid; however, this reacts with the acid producing ammonium which is toxic to cells. This leads to many of the D cells dying and therefore a lower level of somatostatin being secreted. This results in higher levels of gastrin and stomach acid being secreted. This, combined with the damage from ammonium, leads to ulceration of the stomach wall. ↑ Van der Meulen T, Donaldson CJ, Cáceres E, Hunter AE, Cowing-Zitron C, Pound LD, Adams MW, Zembrzycki A, Grove KL, Huising MO (2015-06-15). "Urocortin3 mediates somatostatin-dependent negative feedback control of insulin secretion". Nature Medicine. doi:10.1038/nm.3872. PMID 26076035. ↑ Michael R. DiGruccio; Alex M. Mawla; Cynthia J. Donaldson; Glyn M. Noguchi; Joan Vaughan; Christopher Cowing-Zitron; Talitha van der Meulen; Mark O. Huising (2016-05-02). "Comprehensive alpha, beta and delta cell transcriptomes reveal that ghrelin selectively activates delta cells and promotes somatostatin release from pancreatic islets". Molecular Metabolism. doi:10.1016/j.molmet.2016.04.007. Retrieved 2016-05-30. ↑ Liu, Y. (2005). Gastrin (G) cells and somatostatin (D) cells in patients with dyspeptic symptoms: Helicobacter pylori associated and non-associated gastritis. Journal of Clinical Pathology, 58(9), pp.927-931.